Opening U.S. airspace to drones: After Amazon founder Jeff Bezos revealed plans for 30-minute package delivery via drone in a “60 Minutes” episode, critics derided the idea as nonsense, citing a number of technical, economic and regulatory hurdles. 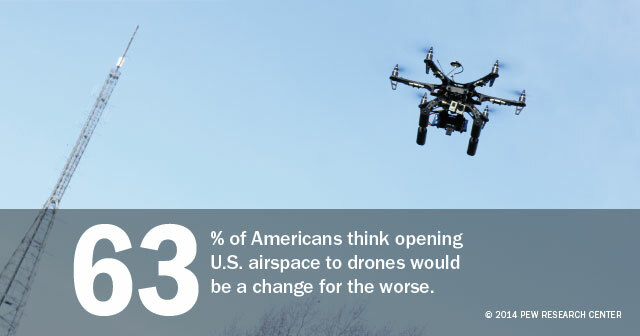 Another hurdle may be that the public is largely unenthusiastic about the idea of giving drones permission to fly through most U.S. airspace: 63% of Americans think this would be a change for the worse, compared with 22% who say it would be a change for the better. 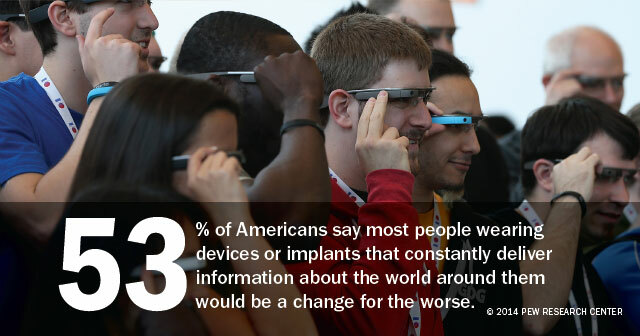 Devices feeding most people information: Google hopes to begin selling its futuristic Google Glass eyeglass-like computers later this year, but it may confront a market of skeptics: 53% of Americans think it would be a change for the worse if most people wear implants or other devices that constantly show them information about the world around them. Women are especially wary of a future in which these devices are widespread. Americans may have good reason to be wary: 53% say they have been involved in a technology-induced distracted walking encounter. 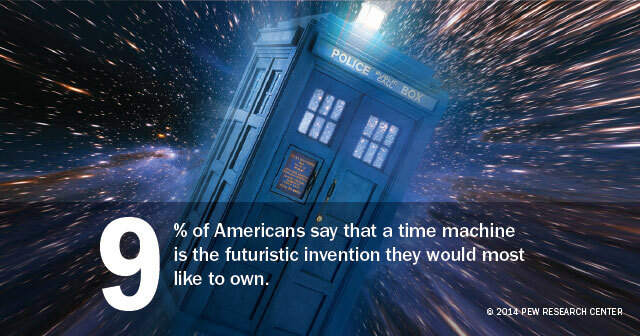 Time travel: About one-in-ten Americans (9%) say the futuristic invention they would most like to have is a time machine. But time travel holds little appeal for older adults—just 3% of seniors named a time machine as their future invention of choice. 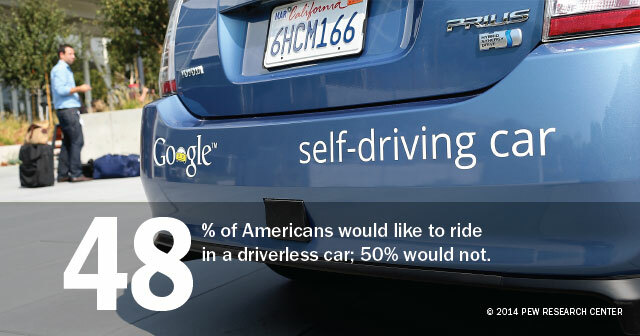 Driverless cars: Americans are split on the idea of riding in a driverless car: 48% say they would, while 50% say they would not. Opinions vary by education and urbanity: 59% of college graduates would give driverless cars a try, while 62% of those with a high school diploma or less would not. And half of urban (52%) and suburban (51%) residents are interested in driverless cars, compared with just 36% of rural residents. Personal robot servants: Some middle-aged Americans just want a little help around the house—8% of those ages 30–49 named a personal robot or robot servant as the futuristic invention they would most like to own, at least double the share in other age groups. 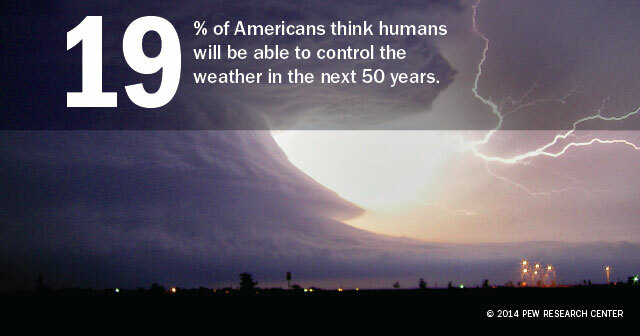 Controlling the weather: Will scientists rid us of catastrophic hurricanes and frigid polar vortexes by developing the ability to control the weather in the next 50 years? No, say more than three-quarters (77%) of all Americans. But there are a few optimists: one-in-five (19%) Americans say this probably will happen. 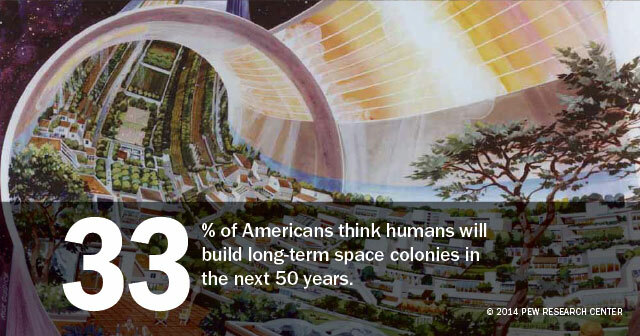 Long-term space colonies: One third of Americans expect to live in a world in which humans have long-term colonies on other planets. Young adults are especially likely to see space colonization as a viable future possibility: 43% of 18-29 year olds see this happening in the next half-century, compared with about a quarter of those over age 50. Among the pessimists are high-income Americans: just 20% of those with an annual household income of $75,000 or more think space colonization is a realistic prediction. 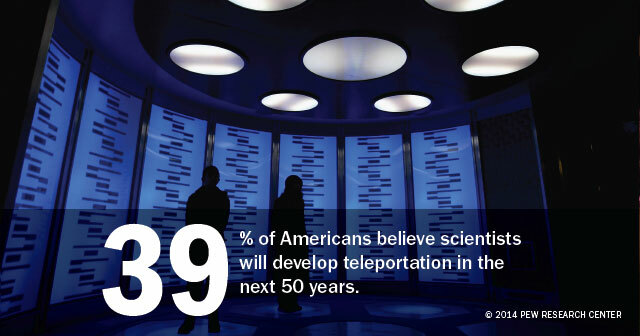 Teleportation: The idea of teleportation has long been a common science fiction trope, but Americans are relatively pessimistic about abandoning their planes, trains and automobiles: less than half (39%) say scientists will have solved teleportation in the next 50 years, while 56% say they won’t have.